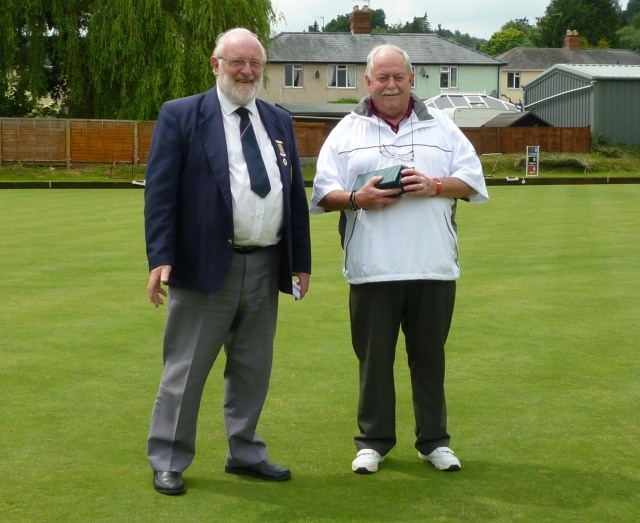 The Friends v Kington B.C. The members of Friends and Kington B.C. line up – still good friends – after the match. On Wednesday July 13th, the Friends travelled from 12 counties to help celebrate the 120th anniversary of Kington B.C. Something that we had realised but for some reason the members of the club had not. 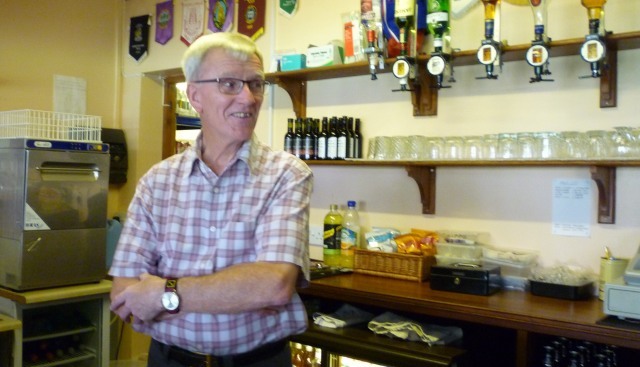 It is a thriving little club with 60 members. Parking was arranged for us so that we did not have to park on the road, which we very much appreciated. You walk down a little lane and then on your left hand side you come across a lovely green and club house. We were made most welcome and greeted with cups of tea or coffee and biscuits. The two non playing Captains then welcomed us onto the green and read out the cards. After the match we made out way back to the clubhouse for a splendid buffet supplied by all the members. Captain Peter then thanked us all for coming to visit and then Adie replied and presented top rink prizes to both teams. 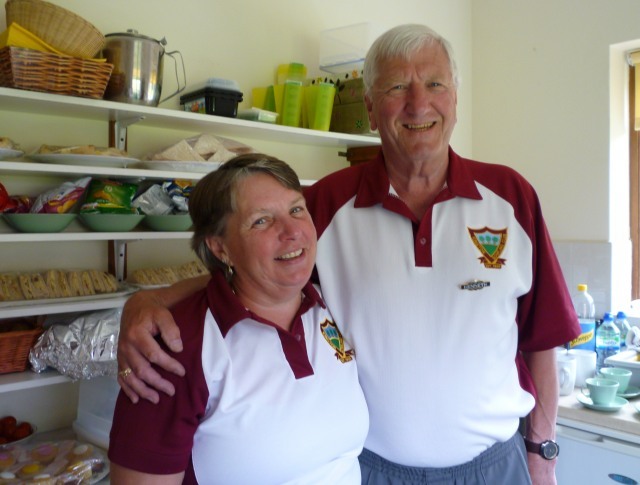 He then told the gathering all about the Friends and the way that we help English Bowling, how we support Bowls England, supplied the first aid tent and pay for the paramedic to be in attendance for the Leamington Nationals. How we support the Hospitality marquee, how we support the youth teams and disability bowls etc. Most importantly how much we enjoy ourselves in so doing and visiting all the different clubs and making lots of new friends. Thank you very much Kington B.C. for inviting us and for such a happy day full of joy and laughter. 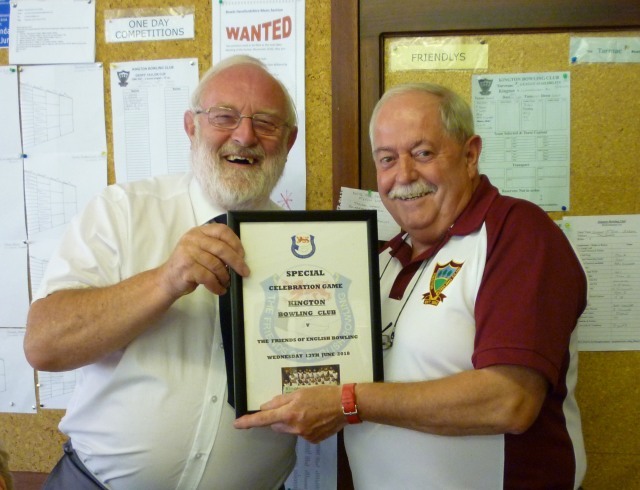 I should add that we won the match 119 – 84 and to quote Adie ‘If you lose you make someone else very happy’.